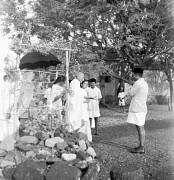 Mahatma Gandhi at the deathbed of Kasturba Gandhi at Aga Khan Palace in Pune, February 22, 1944. Mahatma Gandhi offering prayers at the samadhis of Kasturba and Mahadev Desai, Pune, May 6, 1944. Mahatma Gandhi and others after their release at Aga Khan Palace in Pune, May 6, 1944. Mahatma Gandhi giving darshan from rooftop at Parnakuti, Pune, May 7, 1944. 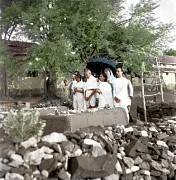 Mahatma Gandhi holding a prayer meeting from rooftop at Parnakuti, Pune, May 7, 1944.